Don Wilkerson - Preach Brother! This product does not quality for ANY discounts. Sealed in mini-LP sleeve with OBI strip. This limited-edition disc has been out of print for at least seven years and is highly, highly collectible. 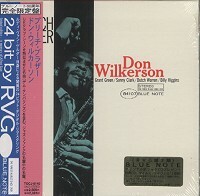 This Blue Note title is 24 bit remastered by Rudy Van Gelder, the original recording and mastering engineer.